Cinderella Moments: Next Dollhouse? Farmhouse? I've been researching for the next dollhouse. I've been thinking of doing a little farmhouse. So I made a miniature clothesline with a miniature dress and overalls. I think I need to kick this idea around a little more. I know you can do it. I love your clothes line. I have yet to see anything that you can't do my friend. I love your house in the previous blog and am amazed at the things you have made. Take care. Your Missouri Friend. Ohhh... you could have fun with a farmhouse! The clothes line is cute. How about a pair of knickers blowing in the wind? A rusty weather vane? Hmmmm..
how cute!! i think a farmhouse is an EXCELLENT idea! i've always wanted to live in a real one. i really hope you do it can't w8 to see what you do! 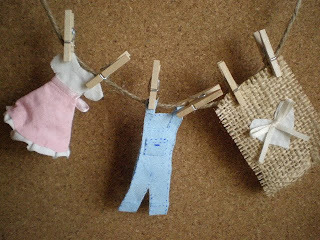 The clothes line is a little cutie :) A farmhouse sounds like a fun project. Good luck with whatever you decide! Yes, me too. I also can't wait to see what you can conjure up! La granja es una gran idea, seria un proyecto precioso!!! La linea de ropa me encanta. Can't wait to see how you envision the farmhouse. Have fun.